Lima, Peru, Climate change negotiations: One word undermines the entire thing. 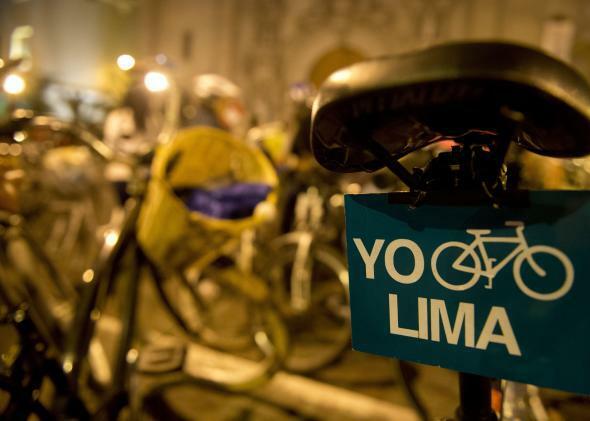 People ride bicycles in Lima, Peru, to send a message to the world about the climate change on the sidelines of the U.N. COP20 and CMP10 conferences on Dec. 4, 2014. Since 1992, the world’s leaders have been meeting annually to talk about what to do about climate change. Despite these efforts, the planet is still on pace for a worst-case scenario—actually, it’s tracking a bit above it. Thanks to exceptionally warm oceans, this year should be the hottest ever measured. The U.N. process has so far produced oodles of protocols and plans of action. Yet emissions from tailpipes and smokestacks the world over have continued on largely unabated. The result has been an embarrassment. After the failures of Kyoto and Copenhagen, it’s difficult to argue with a straight face that the world’s climate is better off because of the more than two decades of diplomatic doldrums that the U.N. process represents. Still, the stakes were especially high this year in Lima, Peru. For the last two weeks, negotiators representing 196 countries gathered there to assemble the first draft of the first-ever global agreement on climate change, to be finalized late next year. As my colleague Daniel Politi reported, this year’s meeting resulted in—surprise!—a largely watered-down agreement. “They seem to have forgotten that they are here to solve a planetary emergency,” the World Wildlife Fund’s Tasneem Essop said in a mid-conference statement. It’s increasingly clear that all the global haggling has become disconnected from reality. The goal seems to be agreement for agreement’s sake, no matter if it’s effective or not. Still, Lima wasn’t as bad as it could have been. For once, those arguing for a stronger agreement actually got the upper hand in negotiations on the final day of talks. After an all-night session that forced an extra day, there remained a divide, generally between the U.S. and China—the same two countries who spent much of the year in secret talks before announcing a historic bilateral agreement on climate last month. A bloc of African countries and many small island states were on China’s side, while Australia, Japan, and the EU joined the United States. So many countries objected to earlier drafts that the conference chair had no choice but to do a major rewrite to include stronger language saying that rich countries have a mandate to help buffer the “loss and damages” that climate change is already causing. China and the developing countries also wanted fewer constraints on the emissions reductions plans they’ll be required to submit for the first time next year. Before the rewrite, the United States issued a word of caution, warning that further tinkering could undermine the international process itself. And it appears that’s probably what happened. In the final version of the text, developing countries largely got their way—including language referencing a temperature rise of just 1.5°C above pre-industrial levels, a target so ambitious that it would likely require a single-minded global focus—but one key word related to international oversight of the emissions reductions plans was changed from “shall” to “may” at the request of China. Had the re-write not occurred, a leaked strategy document showed a coalition of some influential developing countries, including India, were prepared to scrap the entire agreement. This single word undermines much of what climate campaigners were hoping 2015 would bring: a concerted effort to assemble an effective and ambitious global plan of action on a country-by-country basis. The wording of the Lima text, in combination with the fact that any global deal almost certainly won’t have legal force (because the U.S. Congress would never ratify a legally-binding climate treaty), means that whatever comes out of Paris—the site of the next climate summit, in 2015—probably won’t be a game-changer. In one place, the final text borrowed directly from the recent U.S.-China deal, stating that all countries are required to cut emissions “in light of different national circumstances”—a nod to vast differences in capacity. There’s also a substantial 37-page annex that includes the negotiating points, line-by-line, that will comprise next year’s agreement—some of which are surprisingly bold. Just don’t plan on it meaning much. Whatever happens in Paris, it’s sure to be historic—all countries on Earth will now be committed to slowing climate change for the first time. But gone is the accountability or matching of actions to each country’s potential for change. The U.N. process isn’t where the action is on climate anymore. Progressive cities, transformative industries, and mass protests have the best chance of providing the tipping point that’s needed. These talks are a distraction from the kind of urgent, on-the-ground work that needs to happen in order to steer the world’s economy toward a carbon-free path and prepare for the impacts of increasingly extreme weather.